Well, it’s true. Scrap Tales, the wonderful scrapbook store where I have worked for nearly nine years is closing its doors for good. The news just saddens us all who love this store. I started working there as a part-time employee and moved into manager/creative director shortly afterward. I intend to continue teaching and am currently searching for venues. My dream would be to some day open a studio where we could hold classes, crops and other gatherings – oh yeah, I even have the name picked out – Pumpkin Moon Studio. But, the refrigerator died after the power outage we had this week and we had to go buy a new one, so it kicked me back to reality real quick! I am teaching a cute little mini-book project at Scrapbook Peddler Sunday. 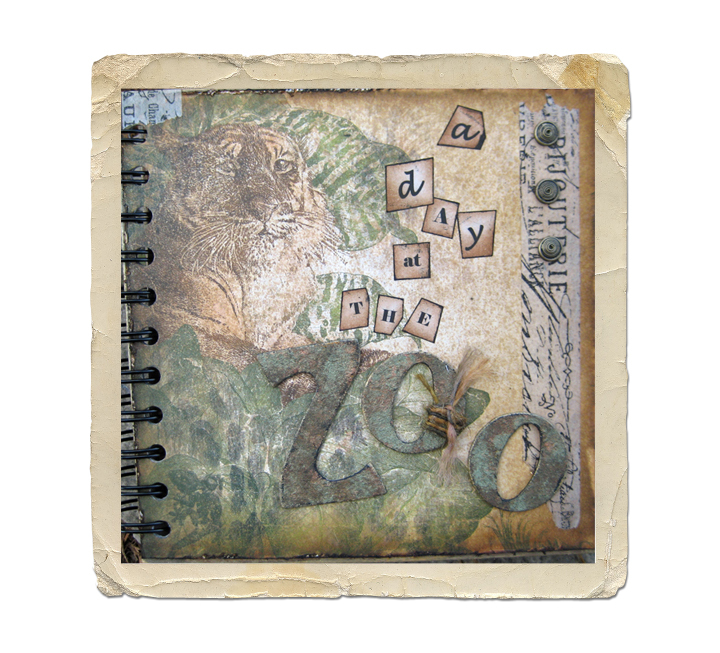 “A day at the Zoo” is made with that gorgeous Zoology line from BoBunny. Students will use Ranger Distress Inks and Clear Crackle Paint, learn what it takes to stamp on acrylic, create hidden pocket pages from envelopes, use Ranger Perfect Pearls to create a patina on chipboard and to make a shimmer mist to spritz on paper and burlap and bind it all together into book form using the Cinch binding system. There were still a few openings when I checked Monday. Ranger Ramblings Part I is also scheduled there for Wednesday, July 27. Contact Scrapbook Peddler to register for either class. If you get a chance, stop in to Scrap Tales and say ‘hey’ before we’re gone; if you can’t make it in please keep in touch here! On our way home from Traverse City yesterday I stopped in the store hoping to see you–just to say, “I’m so sad, too!” When we passed by Saginaw on the highway I said to my husband, “Linda is teaching here.” He had no idea who I was talking about, but offered to stop by the store. How nice was that! I bought a few things, but it was so sad to see the store taken apart. I would love to continue taking classes from you, but I just can’t make the drive to Saginaw. Are you making kits? Or, if you are teaching anywhere closer to me, please let me know. How about Scrappy Chic? I could get to Livonia. In the mean time, I’ll keep reading your blog . . .
I’m so sorry I missed you! I am looking for more local places to teach and will keep you posted on how that goes. I will be selling kits as well – but would prefer to teach! Wish you guys had a place near you – would love to come to Ohio! I, too, am really going to miss all of you.A year ago I walked in to Scrap Tales saying, ” I don’t do this paper stuff, I’m a quilter, but I want to make this one project for a Christmas gift”..Now, I feel like it has become my second home !! I haven’t used my sewing machine in forever because I’m always covered with glue and glitter. Hope you find a new venue for teaching as I have learned so very much from you. Thanks Michele. It may be your second home but I usually considered Scrap Tales my main residence – just ask my husband! Thank you, we’re sorry too. We’ll miss visiting with everyone.